Regardless of your background, denomination or culture, there are certain events and observances that every pastor will encounter or officiate at some time during his/her ministry. Apart from baptism, which is covered in another lesson, the three most common events are weddings, funerals, and child dedications. This series of lessons will discuss some of the traditions and generally-accepted guidelines associated with these events. However, we should say upfront that there is no one "right" way to conduct said events. Certainly, your culture, credentialing authority, your own family customs, and others' personal preferences will play a role in the exact manner in which you conduct these observances. In most Western cultures, the marriage proposal is based on a love relationship between the man and woman. In Asia and the Middle East most marriages are arranged by the couple's parents, often without the man and woman even being able to express an opinion. In the West, most brides wear a white wedding gown and the groom wears a suit, tuxedo, or dinner jacket. 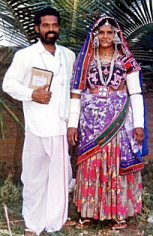 In India and parts of the Middle East, many Christian brides wear a multi-colored sari or flowing wrap, sometimes with a veil, and often resplendent with gold necklaces, bangles, ear and nose rings, hair braids, and anklets. The groom wears a suit, white pants and shirt, or a dress shirt and dhoti [also called veshti, pancha, laacha, or mundu], often with a traditional Indian turban and gold chains. In many parts of Africa, the bride and groom often dress with multiple layers and colors of flowing gowns, extravagant headdresses, and body paint according to their tribal or familial customs. The decorations for weddings around the world also vary depending on culture, natural resources, and the couple's or parents' financial status. Wedding decor may range from huge cascading floral bouquets, ornamental multi-tiered candelabras, flower-covered archways, and white satin runners to flower petals, gold-colored thrones, turtledoves, garlands, and lighted paper lanterns. There is no prescription, no right or wrong way, for how luxuriously or simply a couple desires to decorate for their wedding. As the wedding is designed to be a once-in-a-lifetime celebration of God's goodness and blessings in bringing the couple together to honor Him and each other in the marriage that will follow, the wedding should be a reflection of their love and dedication to God, to their families, and to each other. In addition to the parents or guardians, the bride may have a Maid or Matron of Honor and/or Bridesmaids standing with her at the altar, and the groom may have a Best Man and/or Groomsmen with him at the altar. Or, the wedding party may consist only of the couple's parents, families' pastor, best friends, or other witnesses. The couple generally will exchange vows, either prepared beforehand by the minister or vows they have written themselves; or different relatives and friends may honor the couple with a few words, a blessing, a prayer, or a Bible reading. Many times, the couple incorporates Communion into the wedding ceremony in which the sharing of the elements is their very first act as a married couple. The above list of variables covers only a few of the more prominent issues to consider when planning and conducting a wedding. The entire event may last for several hours on one day or up to eight days and nights in some cultures. Even the mode of transportation for the bride and groom varies from culture to culture, from a decorated white stallion or horse-drawn carriage to an elephant, rickshaw, or chauffeur-driven limousine. Considering all of these variables, it is impossible, not to mention unreasonable, to try to write a lesson that gives distinct instructions on how to arrange and officiate the wedding. At the end of this lesson is a list of websites where one may learn more about various ceremonies in different parts of the world. For now, we shall limit this discussion to the one element that remains the same across the globe  the marriage covenant. Each Christian wedding can be personally tailored according to the couple's own traditions and wishes, but it should primarily be an expression of worship  reflecting joy, celebration, community, respect, dignity, and love. God's Word does not provide any specific procedure or order of rites concerning what should and should not be included in the wedding. The primary goal for the minister is to make sure the couple understands that they are entering into a solemn, eternal covenant with each other and with God. The marriage is a three-way partnership to which each party is irreversibly bound. Thus, the marriage that follows the wedding should be a testimony of their lives before God and a demonstration of their Christian witness. "In the Old Testament the Hebrew word berith is always thus translated. Berith is derived from a root which means "to cut", and hence a covenant is a "cutting", with reference to the cutting or dividing of animals into two parts, and the contracting parties passing between them, in making a covenant (Genesis 15; Jeremiah 34:18-19). "This word is used . . . of a covenant or compact between man and man (Genesis 21:32), or between tribes or nations (1 Samuel 11:1; Joshua 9:6,15). In entering into a covenant, Jehovah was solemnly called on to witness the transaction (Genesis 31:50), and hence it was called a "covenant of the Lord" (1 Samuel 20:8). The marriage compact is called "the covenant of God" (Proverbs 2:17), because the marriage was made in God's name." A closer look at the details of a covenant during Bible times helps us to understand the significance of various wedding traditions. The blood covenant of Bible times  such as God used in His covenant between Himself and Abram in Genesis 15:9-10  began with the sacrifice of animals. After cutting them precisely in half, the animal halves were arranged opposite each other on the ground, leaving a pathway between them. The two parties making the covenant would walk from either end of the path, meeting in the middle. Many Christians don't fully understand that the wedding ceremony is a holy act of worship. It may surprise you to know that many of the traditions in modern wedding ceremonies can be traced back to the Biblical covenant processes. Learning the Biblical significance of some wedding customs can make the couple's wedding even more meaningful. In most weddings, the family and friends of the bride and groom are seated on opposite sides of the church, tent, meeting area, or function hall. This symbolizes the cutting in half of the animals for the blood covenant. The center aisle or area between the two families represents the meeting ground, or holy ground, between the animal pieces where the blood covenant was established. In Bible times as well as in many Eastern and Asian countries today, the parents of the bride and groom choose the spouse for their children. Thus, seating the parents in a place of prominence symbolizes the couple's deep respect for their parents and the parents' responsibility for the couple's spousal relationship. In many cultures, the fathers of the bride and groom clasp right hands as a show of mutual respect and an exchange of the bride from her family to the groom's family. In most Western weddings, the father walks the bride down the aisle and then "presents" her to the groom, thus signifying his passing the responsibility for her welfare to the groom and his family. During the vows, the bride and groom face each other to say their vows and they join right hands and publicly commit everything they are and have in a covenant relationship. Symbolically, they are leaving their families, forsaking all others, and becoming one. The joining of right hands between the fathers and between the bride and groom symbolizes the mixing of blood during the blood covenant when the two would cut the palms of their right hands and join hands. Of course, the wedding ring, a never-ending circle, is a symbol of the couple's never-ending love. However, it also traces back to Biblical times. A ring was used as a seal of authority [remember the story of the prodigal son and his father putting the ring on his son's finger?]. The ring would be pressed into hot wax, leaving an official seal on legal documents. Thus, the wedding ring makes clear the couple's submission to God's authority over their marriage. The exchanging of rings in the wedding ceremony represents the couple's submission to one another in love and also symbolizes the exchange of possessions between the two parties of the blood covenant. Many cultures and religions use the bridal veil in their wedding ceremonies, as it represents the bride's modesty and purity. For Christians, however, it is more than that. It is also a reminder of the veil in the Temple that was torn in two when Christ died on Calvary. Removing the bridal veil symbolizes the access we now have as believers into God's presence. Throwing rice or seeds over the couple at the end of the wedding is a gesture of blessing for the spiritual and physical fruitfulness of the marriage. It is meant to remind the couple that the primary purpose in marriage is to create a family that will serve and honor the Lord. The following free resources may assist you in providing the perfect wedding for the couple in your church or ministry. Use these sample Christian wedding vows from About Christianity just as they are, or modify them and create your own. Choose from 13 sample Christian wedding vows at Bible.org. ForeverWed.com includes wedding vows for several Christian denominations, and more than 400 poems, verses, and readings. Use these Catholic wedding vows and choices for your traditional Catholic wedding ceremony from Wedding Clipart.com. Sample vows and ceremonies for second marriages from I Do Take Two. Thank you for this beautiful day. You have fulfilled the desire of our hearts to be together in this life. We pray that your blessing will always rest upon our home; that joy, peace and contentment would dwell within us as we live together in unity, and that all who enter our home may experience the strength of your love. Father, help us to follow and serve you with an ever growing commitment because of our union. Guide us into greater love and sacrifice as we care for each other's needs, knowing you will care for us. May we always be as keenly aware of your presence as we sense it today on our wedding day. And may our devotion in marriage be a radiant reflection of your love for us. In the name of Jesus, our Savior, we pray. Amen. By the power of your Holy Spirit, pour out the abundance of your blessing upon this man and this woman. Defend them from every enemy. Lead them into all peace. Let their love for each other be a seal upon their hearts, a mantle about their shoulders, and a crown upon their foreheads. Hand-in-hand, we come before you, O Lord. Hand-in-hand, we are stepping out in faith. We, who are gathered here, ask that you would take this couple into your hands. Help them, O Lord, to keep firm in the commitments they have just made. Guide them, O God, as they become a family, as they each change through the years. May they be flexible as they are faithful. And Lord, help us all to be your hands if there be need. Strengthen, tenderly all of our commitments, through Jesus Christ our Lord. Find other sources of Wedding Day Prayers at christianity.about.com. Find additional lists of Bible verses about love and marriage at Wedding Bible Verses. You may also want to browse the websites listed above in the Christian Wedding Vows section for other symbols and elements to use in wedding ceremonies. 1"Christian Wedding Traditions and Customs", About.com Christianity, np. Web. 30 December 2012. 2"Prayers for Marriage", Book of Common Prayer, Copyright © 2010 Zondervan. np. Web. 12 January 2013.